Supporting scholarship programs is one of Cultures of Resistance's top priorities under Education Not War. From Pakistan and Iraq to Bangladesh and the Democratic Republic of Congo, we have helped students around the world gain access to education. Now, we are proud to have created a network of people who have benefited from the different scholarships supported by Cultures of Resistance. The members of the network are graduates of one of our scholarship programs. From 2013 to 2017, Cultures of Resistance funded the Cultures of Resistance SOAS Scholarship, which supported two scholar-activists from conflict-ridden countries pursuing master's degrees at SOAS, University of London each year. Another scholarship program we supported was the Iraqi and Syrian Student Project, which sent displaced Iraqi and Syrian students to undergraduate programs in the United States. Through the Dawood Global Foundation and its platform Ladiesfund, we also funded vocational media training for 100 young women in Pakistan. Past scholarship recipients have formed a network of people who are dedicated to using their educations to help promote peace and human rights. The members of the CoR Scholars Network keep us up-to-date on both news from their region and the inspiring work they are pursuing. Because some scholars face security concerns related to their work, we can only feature a portion of the activity being carried out by the network. Nevertheless, we are encouraged and energized by the innovative efforts to promote human rights that are now being carried out across several continents. Lwamwe Muzima comes from the Democratic Republic of Congo and received the Cultures of Resistance SOAS Scholarship. He completed a Masters in International Law. Read an interview with him and an article that he wrote here. Aye Thein is originally from Burma/Myanmar and received the Cultures of Resistance SOAS Scholarship. He specialized in Globalization and Development, which combined international relations and development studies. He then began doing field research for an Oxfam-commissioned social impact assessment report on the Kyauk Phyu Special Economic Zone in his home region of Rakhine State. Read more here. 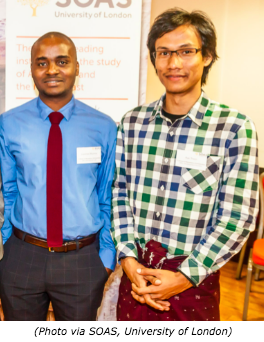 Anmoy Kiron Chakma hails from Bangladesh and received the Cultures of Resistance SOAS Scholarship. He completed a MSc in Violence, Conflict, and Development. Check out his complete bio, a video of him discussing his experiences, and an essay he wrote about his time at SOAS here. Haris Amin Zargar, another recipient of the Cultures of Resistance SOAS Scholarship, is from Kashmir and completed a MSc in Violence, Conflict, and Development. Learn more about his background and read an essay he wrote about his experience at SOAS here. Abdullah Al-Shawk received a scholarship that Cultures of Resistance supported through the Iraqi and Syrian Student Project. He attended the United World College and the Worcester Polytechnic Institute. Read about his work helping fellow Iraqis access education here.